Coachstuff lets you configure statistics whose value is dependent on other information that you've recorded already. We call this a calculated statistic. To run through this example, we're going to use an Aussie Rules football scenario. Why - well it's our crazy local sport ; and we have a nice simple scoring example to go through. Right, here's how it works. In aussie rules, we can kick goals, or we can get points. Goals are worth 6 points, and points are naturally only worth one point. These stats are pretty important if your job is to kick scores - so in coachstuff I might have a setup like the following. And that's great. 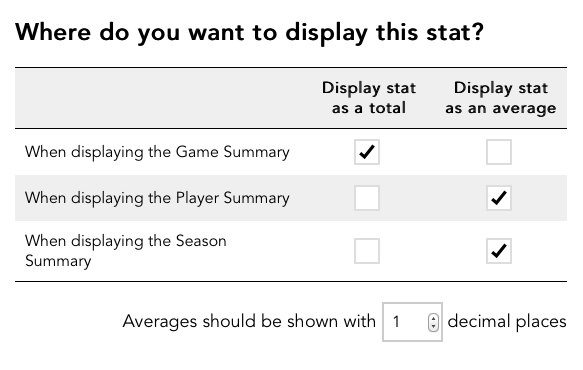 But what if I wanted to know the actual contribution to the scoreboard of a player. Well ; I'd need to manually multiply the goals by 6, then add the points; I've got the total scoreboard contribution. 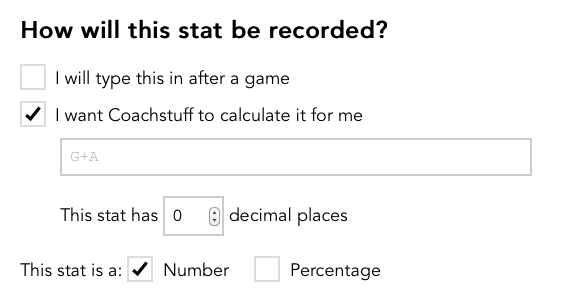 Or, I can just add a calculated stat to my games. Here's the process. OK, start by creating a New Stat ( find under setup ). You can add whatever names you feel like and description here. It's the next screen that matters the most. Click on that second checkbox - telling coachstuff that this is a calculated statistic. Now that you've chosen the calculated method - you need to let coachstuff know what the formula is. You tell us which other stats to use by using their 'Reference' - the short abbreviation used for the statistic in headings. In the example, G is the custom stats for goals and P refers to the custom stat representing points. OK - so a nice easy formula. If you get it wrong, or use references that don't work for us - we'll let you know with a decent error message. ( ) brackets if you really need them! Once you've completed your formula you can move onto the last remaining steps regarding when to show totals/averages for the stat. You can see we've got a new statistic at the bottom there called Scoreboard Contribution. Nice. Finally - you need to use it. 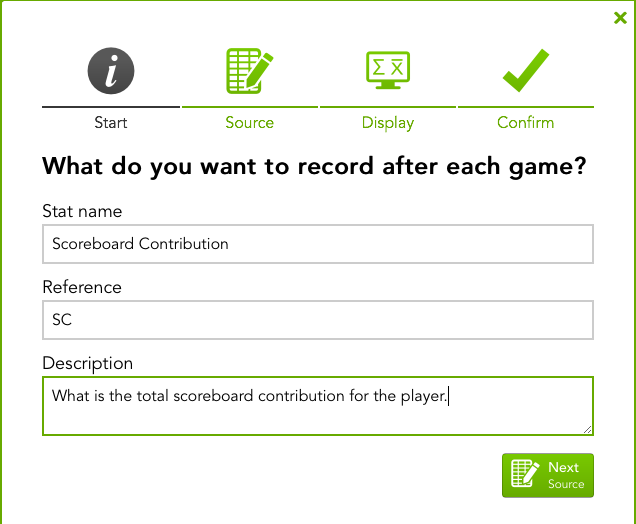 In the example below, Jono has kicked 4 goals and 2 points ; and you'll find the value of SC will update as you change the values for the players Goals and Points. And you're done. Use wisely!